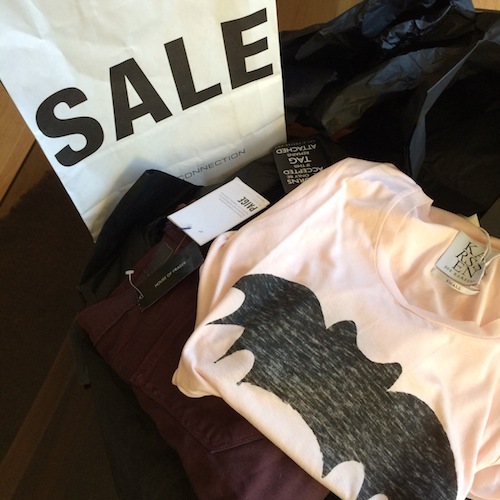 Shopping the Sales: What I’ve Bought. So Far. 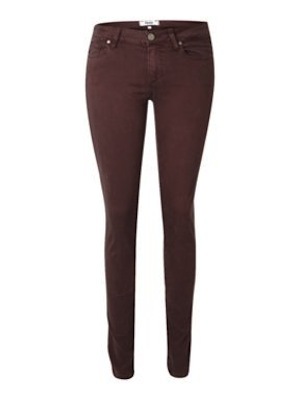 1) Paige Verdugo Jeans in deep purple. I have to say that I’ve never ventured into the “coloured jean” realm before but when I tried these on I was smitten. Colourful jeans seem to be an easy update to a casual outfit and Paige’s Verdugo skinnies are my definite jeans of choice – they fit me well and are nice and stretchy in the waist area. Paige seem to have found the perfect amount of give to their fabric; enough to provide ultimate comfort, but with good firm support and lift around the bottom. Bingo. The purple pair were £219 (I KNOW) but are now £109. I realise, still steep for jeans, but I wear denim almost daily and so invest heavily in them! Find them at House of Fraser here. 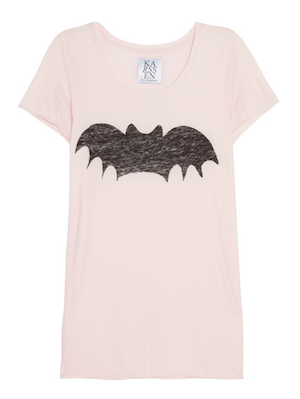 2) Zoe Karssen T-Shirt: had my eye on this for months but I thought I’d gamble on it being in the sales. And it was. Not much of a reduction, really, but the twenty quid off sweetened the pill, as they say. And this is the softest t-shirt, it’s great! 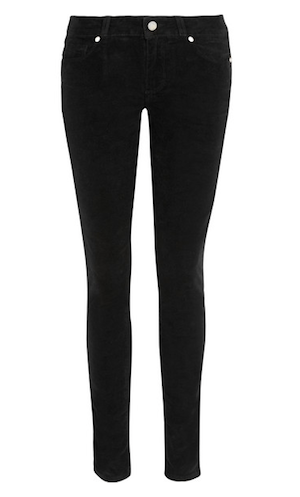 It actually goes very well with the above Paige jeans… Find it here on Net-a-Porter. 3) Paige again – I grab Verdugo deals as and when I see them and these cords were too good to pass up. I always know without a doubt that a size 27 will fit me exactly (though they are on the tight side, post-Christmas, admittedly!) and these don’t disappoint. Note, however, that they do come up quite short – almost at the ankle, really – so if you’re a leggy bird then take this into consideration. I get the feeling that they’re supposed to be this cut and they do look chic with heels. Also quite tidy to wear with boots as there’s no long bit to have to fold upwards and tuck in.. These were £190 full price but are down to £95 here. I may have to pop back and grab a pair of the blue ones here, too, as I have them already but have worn them to death! 4) A lingerie treat: you may remember that I wanted this extortionately-priced neon set from Agent Provocateur but plumped for the Boux Avenue orange one as a finance-saving measure. Well, I have to say that the Boux set is brilliant – very comfortable, good lift – but when I saw the lime green AP with 50% off, I couldn’t resist. This particular package hasn’t arrived yet, I’ll let you know how it is (not with photos, ha!) but there are loads of great reductions on naughty knickers to browse in the meantime. See here for the sale. (Incidentally, Boux Avenue still have some “Chloe” bras in neon orange for £11 here.) The neon green AP Margot set is here. 5) Still on my list; some quality, slouchy cashmere and soft sweatshirts. 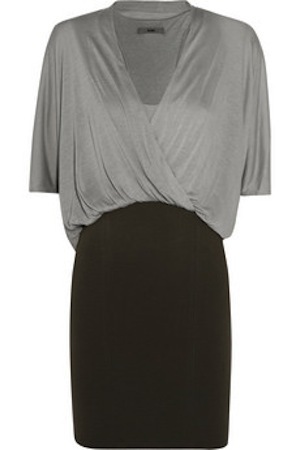 And oh, oh, oh; I don’t need this Helmut Lang dress (above) but I really do want it. It’s not even really in the sales, it’s on The Outnet, which means that it has previously been into the dregs of the N-a-P sale and nobody wanted it even then…but look at that gorgeous draping! The “casual tee” top with the fitted twill skirt! What do you think? What would I wear it with? Would I even wear it? More pics of it here. I’ll keep you updated with my purchases they come and go (back) and I might even do a little video if I can get my act together. Let me know what your sales essentials are in the comments – and if you spot any gorgeous cashmere or soft sweaters, point me in the right direction!